I frequently use a voice recorder for jotting down quick notes or for that late-night flash of epiphany when I don’t have the coherence to hold the moving pen straight long enough to write what I can decipher after waking up. It’s a handy tool and the piece I’ve been using for years was a manual micro-cassette recorder from Sony. It served me flawlessly even when its head started wearing out and recently even the belt which drives the pulley inside crumbled from use and age. I didn’t want to repair it so I retired my much loved recorder and decided to step into the twenty-first century with a digital equivalent. After hunting around for several days, including a few trips to the local dealers, I finally bought a Sony ICD-P620 off the internet. And its amazing. It costs a little more than comparable products from other manufacturers but the difference in quality and performance is distinctly superior. Had I been aware of the difference I would have migrated to digital much earlier. I guess it was nostalgia that kept me stuck to my old manual micro cassette recorder like my infatuation with old typewriters or ancient rotary dialing phones. You remember the black Bakelite monsters the size of two toasters and the weight of a bucket of sand. This new recorder is just a little bigger than an inch by four inches. It weighs less than some of my pens. Yet it can record a whopping 261 hours of notes on a crystal clear monaural track. Perfect for dictation or fleeting flashes of insight. I don’t normally review products here but the one feature which sold me that it works exactly like my old recorder with cue and review buttons simulating the fast and slow speeds of a cassette. It keeps the recordings internally in its four folders with each of the folder holding up to 99 recordings. Both date and the time are stamped on the recorded file. You can also combine recordings or split them up. There are three recording quality settings and two microphone settings for high and low sensitivity depending on the background noise. Being digital, you can hook it up to your computer with a standard mini-USB interface. It will transfer all its files automatically to a folder on your hard-disk. 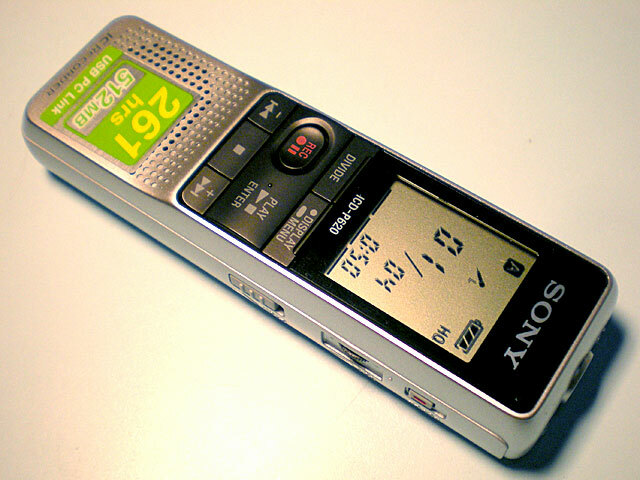 It comes with a audio editing and compiling software in case you want to send the recording as a voice-mail or use the sound-clips for transcribing. The transcribing software is not supplied but if you want your voice to be converted directly to editable text for your word processor, you can invest in the transcribing software. I, on the other hand, enjoy typing so I’ll be sticking to just making notes and comments. My thoughts are more structured when I am typing than when I am dictating. All in all, an excellent instrument to make life a little bit easier and a lot more organized. I would recommend it anyone who needs to write things down to remember them. It’s a handy tool. My younger daughter loves to recite the bedtime stories I cooked-up for her. She giggles in pure delight at the sound of her own voice played back through the small speaker. She lisps her R’s as L’s and is genuinely surprised on the playback because she thinks she is saying them correctly. If you want more details, you can check out Sony’s specs from the link below.